When I wrote the post ‘Amma – to my Mother,’ I knew that this post was soon coming up, just for my father. 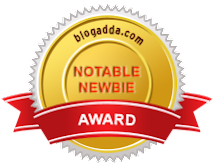 And BlogAdda came up with this contest to mark Father’s Day, thus helping me get rid of my laziness and get this post out faster. To a father, who made a lot of sacrifices professionally and personally, the only thing I could do was to help him realize his dreams, in the form of my success. I might not have been able to succeed a full hundred percent, but he still is happy with the few little things in life that bring joy to him, in the form of this daughter and son’s achievements. Being a person who was forced to study borrowing books from the library, give up an M.Tech seat in the prestigious IIT-Madras (now Chennai), or give up on an fully-funded PhD offer from University of Florida upon landing up with a government job, my father made sure that his children do not have to undergo any of these and get better facilities in life. I am sure any father of this generation does this, and it is indeed heartening to see a lot of us trying to fulfill our parents’ dreams. Just because I said I needed company while preparing for my class 10 exams, my father pursued an MBA course (via correspondence), and ended up working harder than me at the age of 43. When I was in class 12, whether it was an early 5:30 am tuition that I needed to be dropped off at, or picking me up from there after a long day at work, he did it all without a showing any sign of tiredness no matter how hectic his work would get. It was indeed a moment of pride for him and a sense of unattainable happiness for me, when my father went to pick up the academic achievement award from my engineering college (since I was in the US). I then thought I have at least been able to do to this bit for the sacrifices you made for my sake. And to add to this, my sister topped her class in Class 12 exams, the same year, and there was my proud father, picking up another award, on my sister's behalf! This is probably a moment that he might have not anticipated, but surely wished, when he picked my sister or me from the doctor's hands when we were just born. For my graduate studies, I chose to come to the US with my father's (and mother's) encouragement. Being in my final year of engineering, I got busy with the project, seminar and coursework. Getting to the US on an F1 visa demands a lot of paper work in terms of financial documents and other paperwork. For a VISA interview in June, my father had to literally run around starting March to get all the paper-work including bank statements and chartered accountants (CA) statements ready. I am sure, most of us have an idea of how effective the banks or CAs can be, and he showed no sign of taking a break till it was all done. All that I had to do was, to sit with him in the hotel room in Chennai on the day before my VISA interview, and he went over the documents explaining them one-by-one. I was really surprised and probably even shocked at the amount of effort he had put in to get each of the documents, and the amount of detail that he provided. Especially after seeing many of my friends running around all by themselves to get these documents, or even worse with parents asking them to take a job after engineering, I felt really lucky to have a father like him. I have always had this respect for my father for the reason that, he made sure my mother got back to studies after she got married to him while in the first year of college. It was probably under forced familial circumstances that he had to marry her, but ensured that my mother's future was not going to be in the kitchen and in the backyard of our house. She went on to get three professional degrees and become a well-qualified teacher. Also, a father's role is quite important in the upbringing of his children. I discussed this point with director Onir (of My Brother Nikhil fame) in a conversation on the micro-blogging site Twitter. He agreed with the fact that, if a father helps in the household chores at home and spends a lot of time with his children, it helps in the better upbringing of the children. The children will make sure that they help their spouse in managing the house later on their life and probably bring up their children that way too, thus creating a good example for the generations to come. By believing in division of labor, my father usually helps my mother, (a working woman) in many household chores, thus setting a good example to us. There are a few guys even in this so-called modern age, who delegate their wives to just household chores, without giving them a chance and forget that the wife needs to have a life too! He values her independence too, and helps her take a break from the routine chores by making/getting breakfast and cleaning up the house on most days. From a very young age, my sister and I have helped our parents together in managing the house, and I am quite proud of this fact because, this helped me be a lot more independent when I got to the US for my graduate studies. He surely respects my sister's independence and mine too. As with many parents, with a set of restrictions (which I feel is mandatory while growing up), we have evolved to be young responsible adults. Depending on what was considered a necessity and what was a luxury, my father helped us by marking a good line between the two of them, and this aspect has helped me a lot in the recent days. By being open about every aspect my life, I seek advice from him, because I believe that he is my best role model. I truly value his words of advice that have come at the right instance. I surely cannot take after this wonderful gentleman, who has been instrumental about every success in my life, stood by my failures, adequately handled my ignorance, put up with my childish pranks to this day and more; men like him are not made often. The only thing I can say to him is – Appa, I am really blessed to have a father like you. Can almost relate to all these ! Nice simple style of writing too. True to the letter! only I wish I had as many words as you do! True to the bits and bytes of the letters!